In Lyon, France’s third most populated city, after Paris and Marseilles, an impressive ventilated facade can be found, created by Butech, with PORCELANOSA Group’s Solid Surface, KRION. 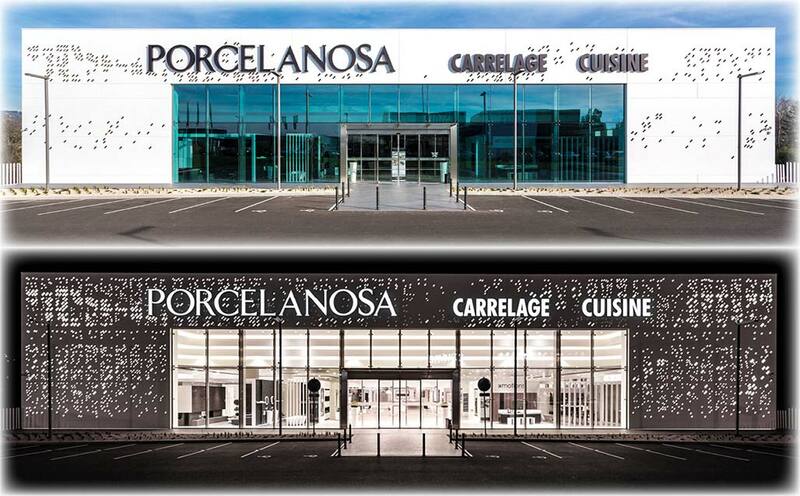 A place as important for the group as PORCELANOSA Lyon would require an impressive attraction, and for this there is nothing better than KRION, where the possibility of machining has been specially represented in the 600m2 of Solid Surface sheets, which are in the KRION colour 1100 Snow White. When lit up, the design of the facade, made up of machining, internal and external bas-reliefs, presents us with a pixel effect that gives the store personality. The company belonging to the PORCELANOSA Group, Butech, specialising in providing technical construction solutions, used K-FIX and K-BOLT anchoring systems to attach KRION to the profile. Butech and KRION, once again an ideal combination.